Though we are currently in between terms, there is still much activity going on at Proverbs Junior! Currently, tiles are being laid and paint is drying in both of our new classrooms and our new, modern bathrooms. We are very excited about the completion of these much needed capital improvements and look forward to our students returning next semester to an improved school grounds. These improvements will promote better learning and improved hygiene for our students as part of our school’s holistic approach to bettering the lives of children in Busia, Uganda. Work progresses on our main building. Here it is shown with its fresh undercoat, ready for the final coat to be applied. At the same time, tiles are being laid in the building’s two upper classrooms. Our younger students are enjoying a well-earned break, but our oldest students, those in Primary 7, are right now hard at work studying for their upcoming National Exams. 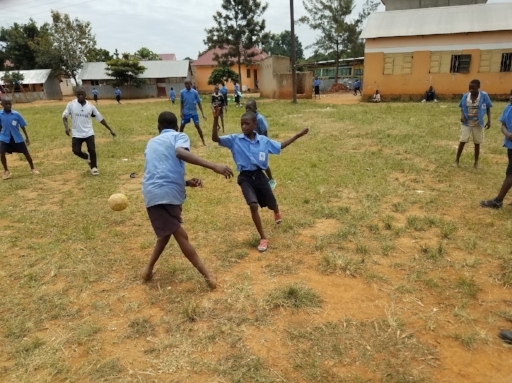 Historically, our students have performed extremely well on this test against their Ugandan peers with 95% of them scoring in the 1st or 2nd division (out of six total divisions). We look for great things from our current class of P7’s as well. The National Exam is very important for our students as it determines the quality of the secondary school which they will be able to attend. Also, it is very important for the Proverbs Junior as a whole since parents use it as a gauge for the success of the school and an important factor in their decision whether or not to entrust their students to our care. Immediately following the close of the school’s second semester, our teachers gathered to discuss improvements for the next semester with our Chairman and advisor, Stanley Ojiambo. Mr. Ojiambo is a retired teacher with 39 years of experience. The teachers discussed the difficulties and successes of the past semester and how they can improve in the upcoming semester. One of the many things that distinguishes Proverbs Junior from the country of Uganda’s public schools is our small class sizes – 10 students per teacher on average vs. 70 or 80 children per teacher in some public schools. The teachers heard an international perspective from a visiting worker, Peter Melnik. Mr. Melnik shared from his experience attending a school with small class sizes. He gave advice to the teachers on how to best take advantage of the school’s small class sizes to individualize their approach to teaching and motivate their students to achieve their academic best. The kids at Proverbs Junior love soccer (especially the older boys) as well as many other outdoor activities. The teachers and administration are glad of this and we promote healthy activities for all of our students so that their bodies, as well as their minds, continue to develop into the full potential which God planned for them. We are currently working to design and order school sports uniforms to supplement our school’s uniforms. These will promote school unity and bring a strong new look when our students face off against other schools in athletic competitions.